Book hotel rooms online with us at Hotel Montechoro at the lowest rate, guaranteed. 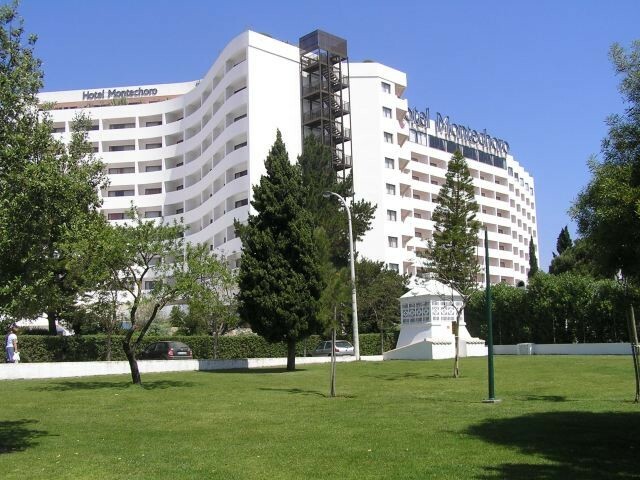 Get a holiday discount room rate at the 4 Star Hotel Montechoro located in Albufeira in the Algarve. The hotel is 400 metres from the lively bar and club area known as the Albufeira Strip The holiday hotel has 362 air-conditioned bedrooms providing accommodation for two to four persons. Each bedroom is equipped with satellite TV, radio, direct dial phones, Wi-Fi, safe, mini-bar or fridge, balcony and a hair dryer in the bathroom. The Hotel Montechoro in the Algarve provides many facilities that include a Grill room, general restaurant, bars, coffee-shop, gift shops, hairdresser, pool for adults, pool for children, a Health Club, a Fitness Centre, sauna and steam baths, aerobatic classes, squash courts, games room, garden with a lake, two football pitches plus supporting changing rooms and a medical room, eight tennis courts plus coaching, live night entertainment during the season and a daily activity programme. A courtesy bus takes guests to the town centre and the Praia da Oura beach.